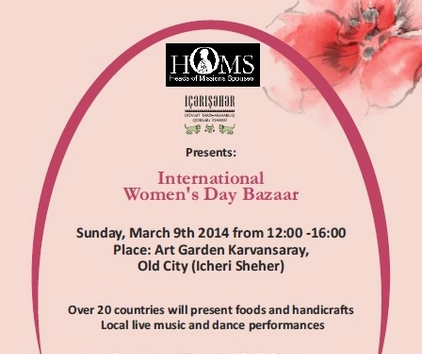 Art Garden of Small Caravanserai in Old City of Baku hosted a charity event commemorating the International Women's Day on March 9. Organized by the Heads of Mission Spouses (HOMS) Charity Projects, with the support of "Icherisheher" State Historical-Architectural Reserve, the event brought together participants from over 20 countries. The bazaar featured an exhibition and sale of national samples of crafts, food and souvenirs by participating countries, as well as traditional dances and music and a lottery. The funds collected at the bazaar will be sent to several local charities that work together and are supported by HOMS.